I first visited Brown’s Ranch a month after we moved to Arizona last year and fell in love immediately. One of the things I liked about our new house was its close proximity to some of my favorite local trailheads, Brown’s Ranch included. I haven’t been much since the fall, only visiting on Christmas and New Year’s Eve, at first because I was exploring another area (also near the house) and then because I was concentrating on trails near some of the other houses we were considering. While I haven’t had much time and/or energy for hiking lately I was up for an easy hike last weekend so I begrudgingly got up before sunrise and made the short drive to Brown’s Ranch. 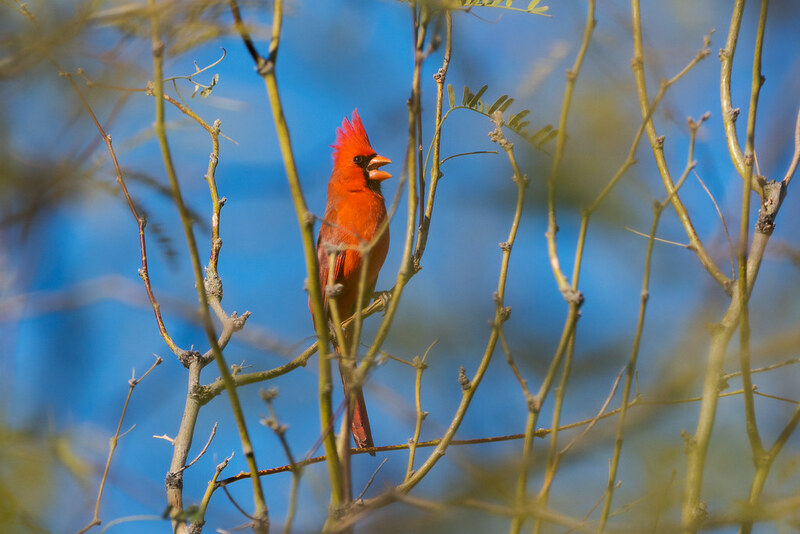 A cardinal serenaded me before I stepped out of the car and I could hear the calls of Gambel’s quail and mourning doves and cactus wrens all around. I thought about how much I had learned in my year here, how much more these sights and sounds are familiar to me now, as I grabbed my camera and headed to the Jane Rau Trail, a short little loop trail near the trailhead and the first trail I hiked at Brown’s Ranch last year. I then headed down the Latigo Trail, despite my low energy levels I was so happy to be back that I almost felt like running. I didn’t, however, feel much like taking pictures, a feeling I get sometimes where I almost put the camera away. I usually keep the camera out but there is a mental shift where I don’t worry so much about photography. Sometimes though the animals pull me back in, as they did on this morning. 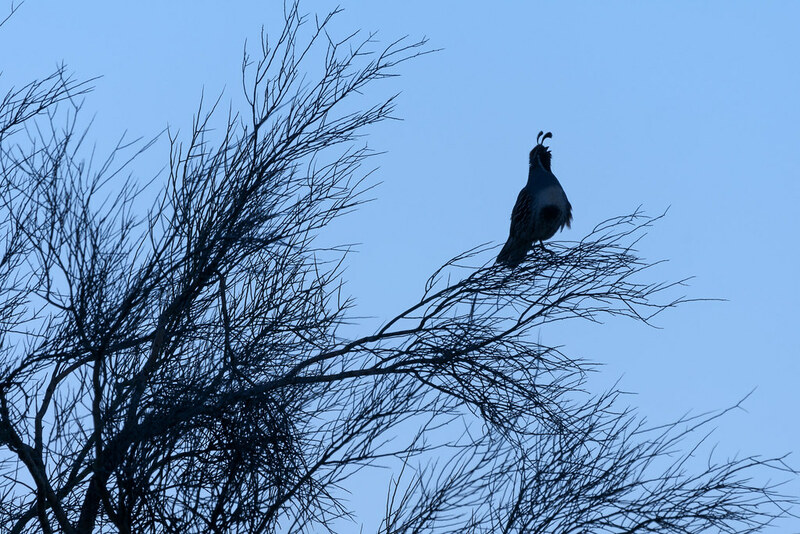 It started with a Gambel’s quail in the trees, silhouetted against the morning sky, I took a quick picture against the blue sky before moving further on and taking another against the orange sky. 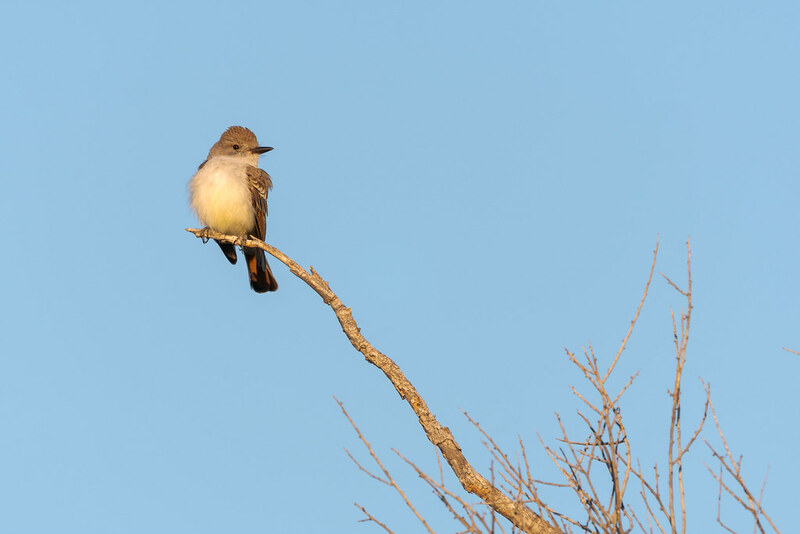 As the sun rose I spotted an ash-throated flycatcher and couldn’t help but stop for some pictures. 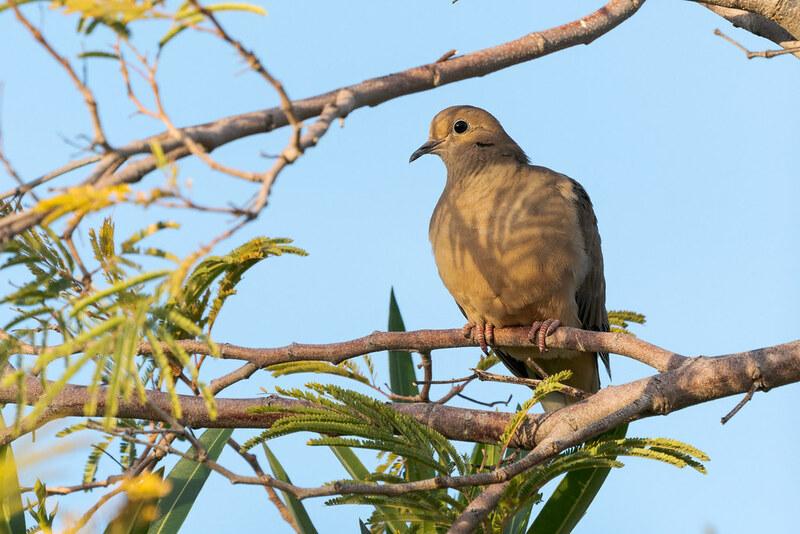 It didn’t stay long as a couple of mourning doves flew into the tree and scared it off, so I photographed one of them instead. 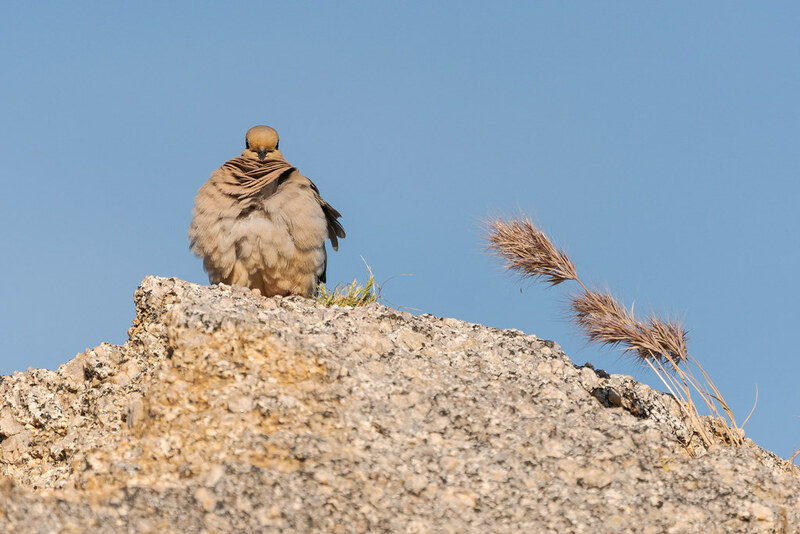 They were out in abundance, I imagine the white-winged doves will be back in numbers soon and the smaller mourning doves will get moved a step down the pecking order. Beside the trail the banana yuccas were budding and blooming, a sight I hadn’t seen before, and I thought I could spend a lifetime photographing them in their various stages, each beautiful in its own way, but I wasn’t in the right frame of mind to photograph them on this morning. 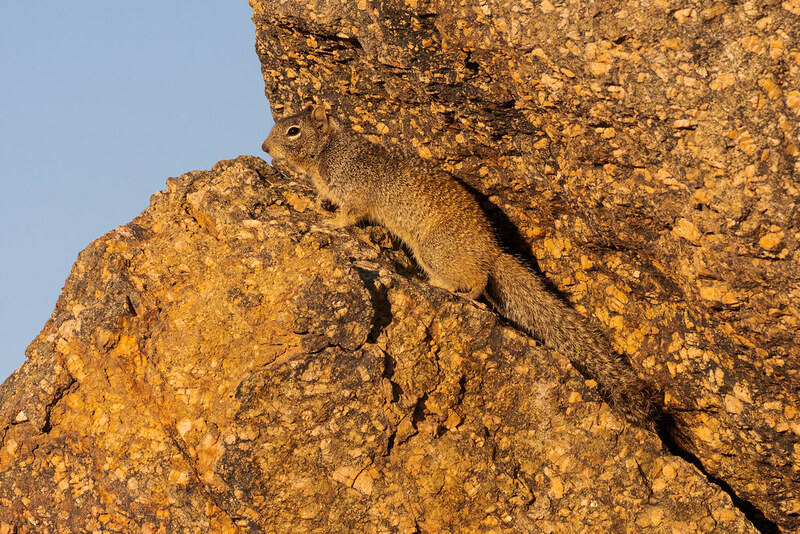 But when I saw a familiar shape in the rocks, bathed in the lovely morning light, I eagerly setup my camera beside the trail to photograph what I initially assumed was an antelope squirrel but which I quickly realized was the larger rock squirrel. I had seen them before but usually from a distance, only once getting a close look up at Tom’s Thumb. This one though posed for me in its rock home and now in more of a photographic mood I photographed it with different focal lengths, including wide and medium shots and this full on close-up. 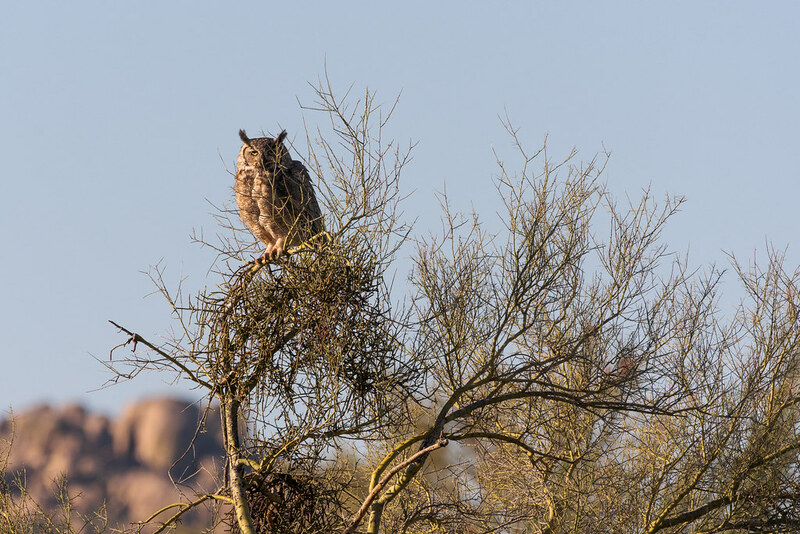 Further up the trail I stopped when I thought I saw a hawk on a distant saguaro, but when I lifted the telephoto lens to my eye to get a better look I realized it was a great horned owl, my first owl in Arizona. 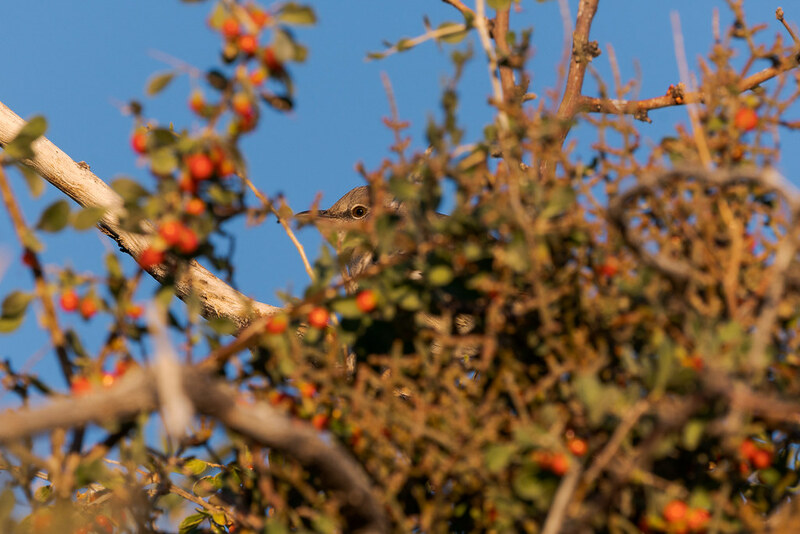 It flew a little closer as an American kestrel hassled it from above and landed in this foothill palo verde. It occasionally cast its eyes over towards where the rock squirrel was but it didn’t seem too interested in hunting. I continued up the trail a bit but didn’t go too far, I was tired and while there are times it’s good to push yourself, this morning didn’t feel like one of them. 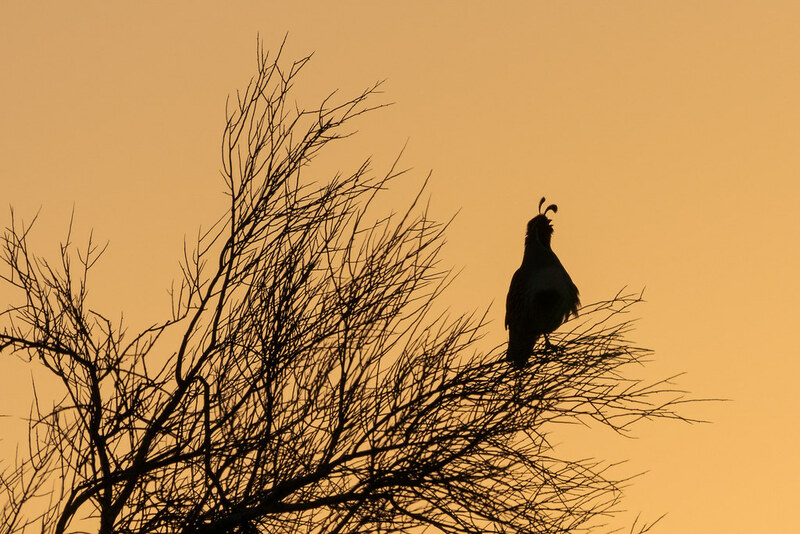 As I headed back I did see a couple of genuine hawks on a large saguaro, a pair of Harris’s hawks that I suppose will be nesting soon. A grasshopper accidentally impaled itself on a buckhorn cholla and I thought my hike might end on a sad note but then I saw a mourning dove preening from a rock above as the breeze rustled its feathers. 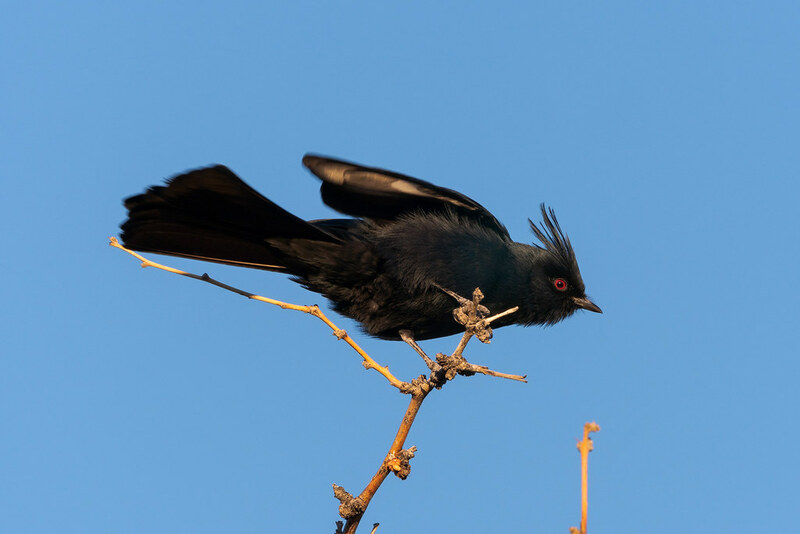 The first bird I saw from the backyard of the new house was a male phainopepla, sitting in a tree in a narrow wash beside our yard. 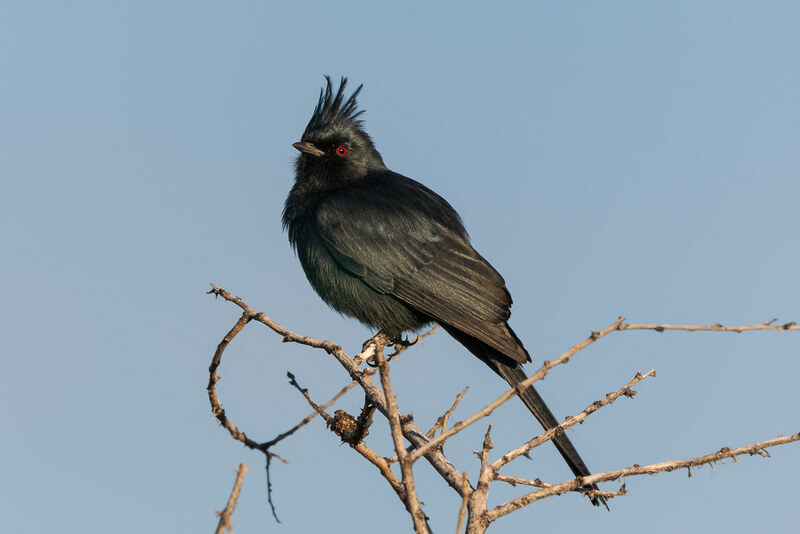 That’s a new one for me, I’ve seen quite a few birds in the backyard of our rental house but until now the phainopepla I had only seen on the trails. I saw this male on the Marcus Landslide Trail where they were numerous this winter, I haven’t been back recently but will soon as the trailhead is only a 10 minute drive from the new house. 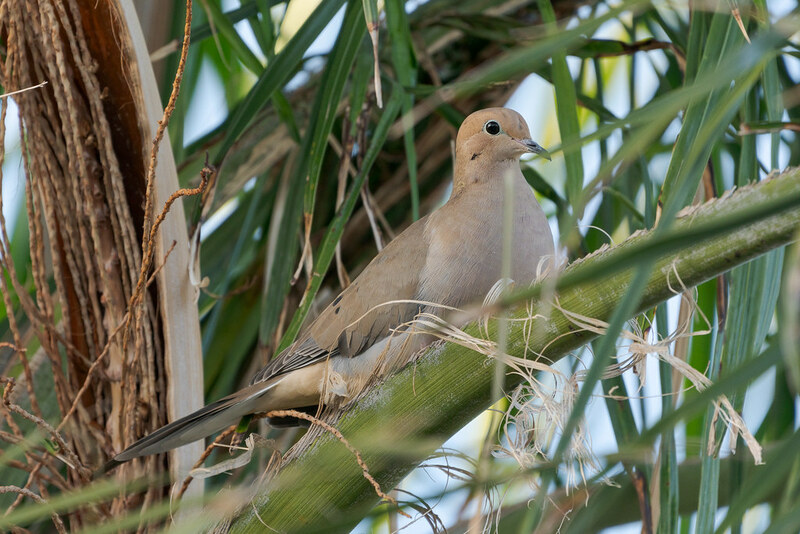 A mourning dove perches in a palm tree in the backyard of our rental house. We have a couple of dwarf palms in the backyard of the new house but they don’t allow full-size palms (there are native trees in front and back). 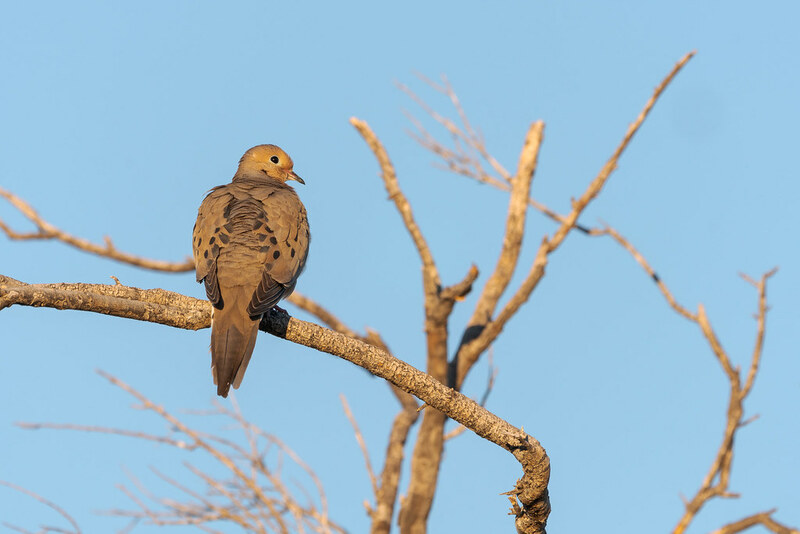 One of the joys of our rental house has been the abundance of doves, from the larger white-winged doves to the little Inca doves. After the white-wings migrated out it was the mourning doves who were the dominant bird we saw all winter, providing endless entertainment for the cats who watched them from the windows. I see you, you see me, mockingbird atop the tree.